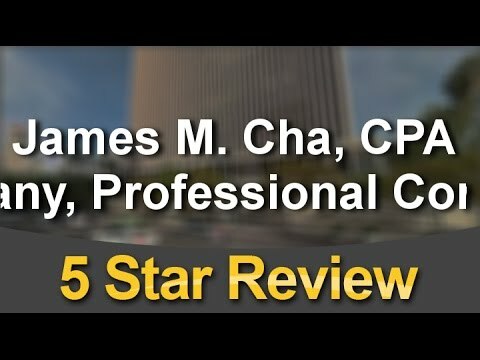 Testimonials | James M. Cha, CPA & Co. “Great!! I am a client now… Thanks. They did my 2016 taxes and filed late election paperwork with reasonable cause statement for my S Corp status, which I thought that everything was done right but not done properly by prior CPA when I changed from a DBA to Corporation. They updated the Minutes for my corporation to keep me in compliance with California laws. They filed my personal 2016 taxes as well. James and Janice reviewed my 2015 Taxes per my request. I like their services so well so I hired them to keep my business on tract bookkeeping and payroll up to date. They cleaned up, and organized my mess, and I was amazed! I am truly relieved, it’s a load off my mind, now I can focus on making money. “James Cha and his team have been an amazing support to get our bookkeeping and accounting back on track which we could not have done without them. We can reach out to him anytime with any questions. James and his team are very helpful in guiding us through day to day accounting tasks. It is a great relief to know you have such skilled, professional and trustworthy people on hand. “James Cha CPA has been amazing and takes care of all of my business accounting, payroll and tax services. Finding a good CPA is tough and frustrating. I had a very bad experience with my previous CPA that I started looking for a new CPA to work with. I went to many firms and spoke with them in person before making my decision to start working with James Cha CPA. It has been a little over a year and is very satisfied with the company. They are professional, helpful and caring. I am so happy to have made my decision. “James and his staff are nothing short of phenomenal! Very friendly and professional but most importantly he knows what he is doing! I have recently started using James within the past 2 years, and compared to my old CPA, its a different world. In terms of pricing, definitely worth every penny! What I love the most is how accessible he and his staff are to me as a client. They are a great team and I would def recommend them for anyone looking for a CPA! I had a very good experience with James Cha and his whole staff. They got my Corporation taxes and payroll in order very quickly and with great feedback and customer service. I would not hesitate to recommend them friends and business associate. “Being fairly new to the self-employment world and also a new property owner, I decided to enlist the help of James M. Cha, CPA & Company to prepare my seemingly complicated tax return. I came in with receipts that I tried to organize, and they found a way to make sense of it all. Mr. Cha and his team are highly professional, honest, and competent in their work, which made for a FANTASTIC experience. I highly recommend James Cha, CPA & Associates, and will definitely return next year. “James and his staff were terrific and exceeded my expectations. 1. He actually returned my phone call from my initial contact with James’ office. That may not sound like a big deal to some, but I was not one of James clients at the time. 2. Professionalism… Once my taxes were complete, James reviewed them with me. His ability to educate me on how to handle my expense transaction and paperwork were refreshing. After my experience, I actually was looking forward to implementing James’ cataloging system. 3. KNOWLEDGE. Very difficult to understand, unless you experience for yourself. While reviewing my taxes it was only then, I realized what I had been missing in an accountant. James is not an ordinary accountant that can recite IRS rules and regulations, but he actually understands them and applies them. In simple terms, I felt as though I had the IRS, a tax attorney and an Accountant at once. I feel like I cannot put into words James’ knowledge of the tax code and actually making it work for you. I entered into James’ office with a mess of paperwork and left with a complete tax plan. 5. Money… I went into James’ office thinking this is going to cost me a bundle of money for hiring a widely-respected accountant such as James. In reality, James’ ability to know tax structure actually saved me more money on my taxes than I could have imagined. In simple terms…, I felt like I was undercharged for his service. 6. STAFF… James’ office staff was not just a staff of part-time workers shuffling papers. They were a qualified group of highly-educated professionals. They knew every portion of my tax information without having to stop to look at my life. I felt as though this was an army of tax assassins in a mission. “I have been working with Jame Cha, CPA & Co. for more than 20 years, and have received services for many different kinds of businesses. I am not worried about getting audited by any government agencies because this firm gives me confidence and security. Previously, I was audited by the IRS, Franchise Tax Board, and Board of Equalization. My worries always resulted in nothing more than clean, perfect and satisfying results. I can trust this firm to provide me with excellent service not only for audits, but also with my tax planning and business accounting. This firm is always available to answer my questions and helps me with any problems I have. “James Cha CPA firm is the most dependable accounting firm in town. I’ve known him around 25 years. As a business man, I had different types of small to medium businesses during that period. No matter what size of business I operated, he’s been serving so well such as tax savings, preparation all documents for bank loans, every month reports, and what I have to do, and financial counsel as well. The firm supports every aspects of business that I needed to glow and my personal tax matter too. So, I end up with saving a whole lot of money personally. Even this year my income tax refund amounts were pretty big~~. “When I first visited Mr. James’ office 19 years ago, he analyzed my prior years’ tax returns thoroughly. Then, he saved the first year’s tax $s significantly, with tax credits and deductions I was eligible for. He has superb talents in coming up with tax-saving ideas and plans. Since then, his office has been providing my several businesses with the supreme care and very fast response time. Mr. Cha and his staff members including Ms. Janice are very well-organized, efficient, and so knowledgeable in their fields. “Awesome professional service. I would like to recommend his CPA services with professionalism to anyone who looks for excellency. 정확히 그리고 나에게 꼭 필요한 맞춤서비스로 항상 도움을 받았습니다. “처음 세금보고부터 지금까지 제임스차 회계사님을 이용하면서 배운점이 많습니다. 우선 풍부한 경험이 제일로 마음에 드는 부분입니다. 미국 회계법의 경우, 경험없이 하기 힘들고, 지속적으로 업데이트 되는것을 항상 첵킹하지 않으면 놓칠수 있는 부분들이 많기 때문입니다. 타운내 과대홍보를 하면서 비용을 저렴하게 하는곳으로 세금보고를 맡기는것은 그리 좋은 방법이 아니라고 생각합니다. 물론 다 그렇지는 않겠지만 대부분 수임료가 싼곳은 그만한 이유가 있는법입니다. 저같은 경우 해외생활하면서 배운것은 두번일 하지않도록 확실한 곳을 선택합니다. 변호사이던 회계사이던 간에 말입니다. 정당한 비용을 지불하고, 확실하게 일처리를 하는것이 마음이 놓이기때문입니다. 제임스 회계사님의 경우, 저도 소개로 처음 세금보고를 맡겼는데, 나름대로 만족할만한 결과를 얻었습니다. 그리고 세법을 지속적으로 연구하면서 고객분들에게 최선책을 보여주는것이 느껴졌습니다. 특히 회사관리의 경우, 정말 좋은것 같습니다. “세금보고를 어느분에게 맡겨야할까 고민을 참 많이 했었는데 Korea Daily웹사이트를통하여 제임스차 회계사님을 접하게 되었어요. 다른 회계사님과는 직접 통화가 참 어렵더라구요~~ 그런데 회계사님과 직접 통화가 이루어지는 시스템이 되어있어서 좋았고, 많은 금액을 절세할수 있게 해주셨어요.